What does it say about your party when doing things illegally (voting, citizenship) is perceived to be the only way to win elections? Pennsylvania’s voter identification law could sink President Obama’s reelection campaign, according to the Democratic Congressional Campaign Committee (DCCC). Allow me to serve as proofreader – the phrase ‘suppress the vote’ should have read ‘suppress the illegal vote’. That one is free. Anyway, the Dems can’t even use their usual talking point in Pennsylvania – that poor minority groups would be unable to attain the necessary ID – because it is free and can be obtained months ahead of the election. The Secretary of the Commonwealth of Pennsylvania is creating a new voter ID card that is free for people without other forms of ID. 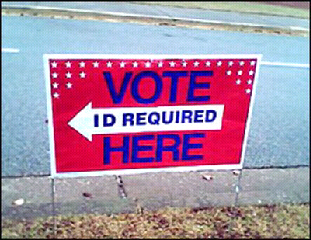 The only way to interpret the statement that voter ID law could sink the President’s re-election bid, is that the Democrat party feels they need as many illegal votes as possible to have a chance. The Congressional Black Caucus on Monday night took to the House floor to charge that voter ID laws popping up around the country are aimed at dissuading minority voters from voting, and making it harder for President Obama to win re-election. It takes tunnel vision for a person to believe that voter ID laws are racist or an act of minority suppression. It takes a candid admission – albeit, inadvertently – to believe that proving your identity can only harm supporters of President Obama. In short form – doing things legally is a detriment to the left. Next post Report: Obamacare is a "Big Tax, Particularly on the Poor"